The proposed fine art book has written content and over fifty photographs prepared for a publisher’s final selection. The manuscript includes historical references, photographic notes, including anecdotes of how Eagles of New York™ came to be realized in the heart of the bustling metropolis, and stories that touch on the surrounding history, architecture, and sculptors that created the eagles. 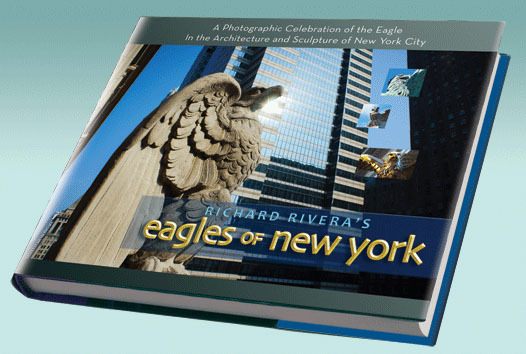 Richard Rivera’s Eagles of New York™ speaks to the culture, resilience, and dynamics of an amazing City and is the first-of-a-series of fine art books covering art projects in major cities around the world, including Melbourne and London. Click below for manuscript excerpts on the architecture, history, and sculptors. For fine art book publishing opportunities and to purchase images from this or other Rivera collections, commissioning, sponsorship, exhibiting, and other information, please contact Christianne Carin.